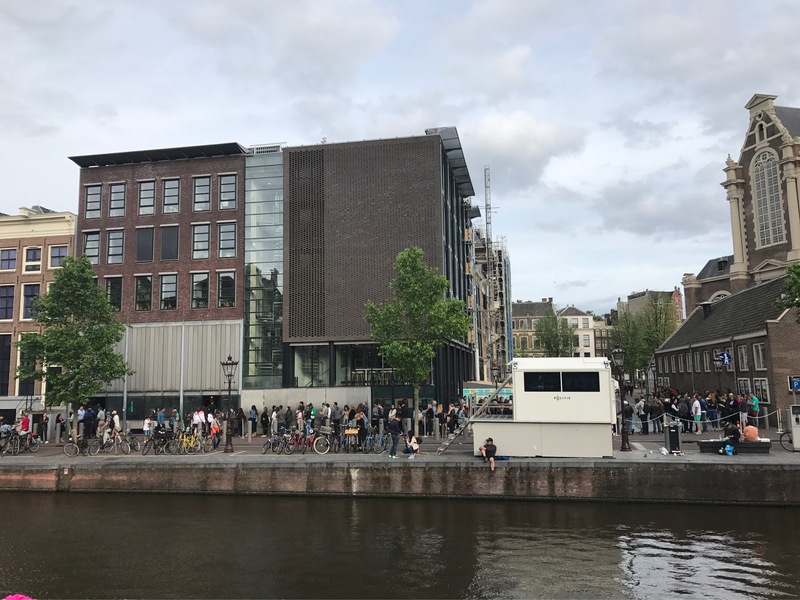 One evening, we decided to try our luck in the line at the Anne Frank Museum. Lines are historically long, and morning reservations are made online months in advance; by the time I checked they were all gone. So, every day after 3:30 pm, hundreds of people wait two or three hours to get in. Thankfully, they’re open late (until 10 pm!) 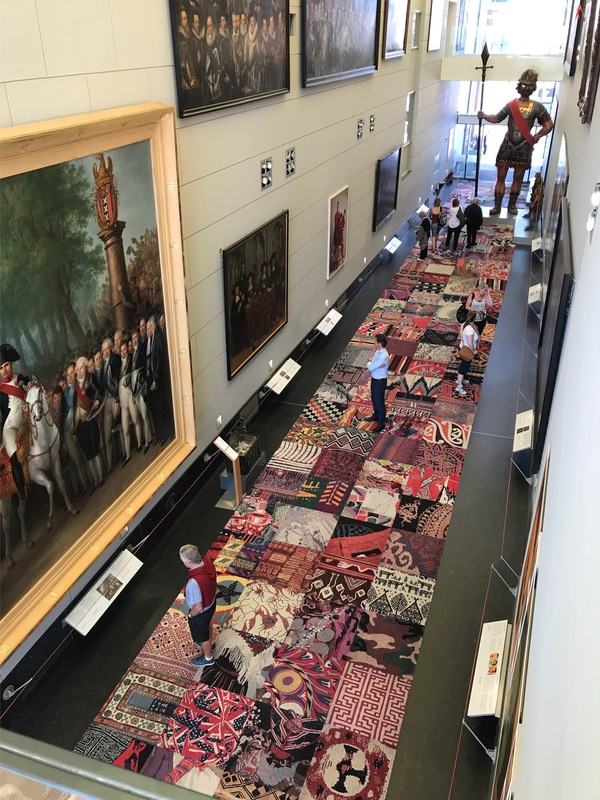 to accommodate so many visitors. Knowing we might not eat until very late that evening, we grabbed some fries to go (with mayo for me, of course) and rode the train into the city. Fries are definitely a thing (in both Holland and Belgium) and they. are. delicious. They are definitely different than our fries here–slightly larger than traditional size but smaller than steak fries–and not greasy at all. They’re sold out of fry shop windows in little cones, perfect for on-the-go snacking. 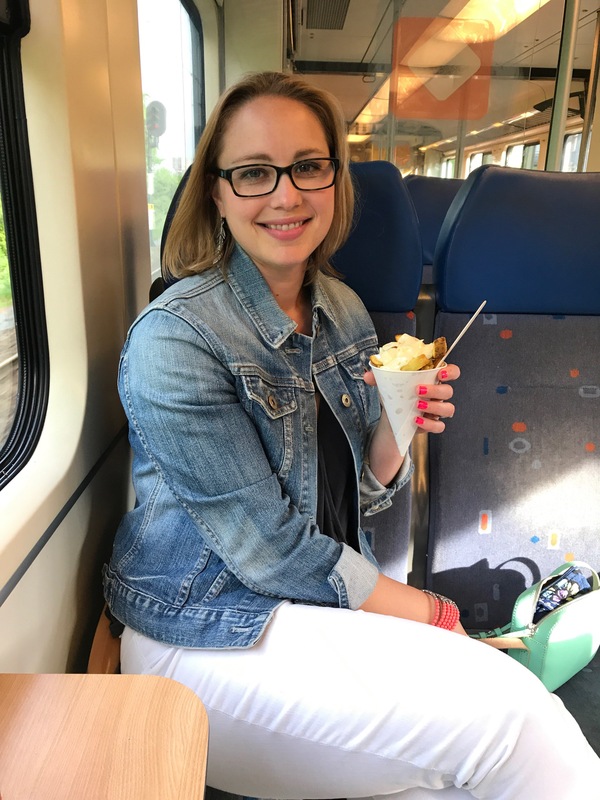 I started eating my fries with mayo in college (no idea how that started), and that’s how they like them in the Netherlands. Other sauces are available, including a peanut satay, but ketchup isn’t very popular. 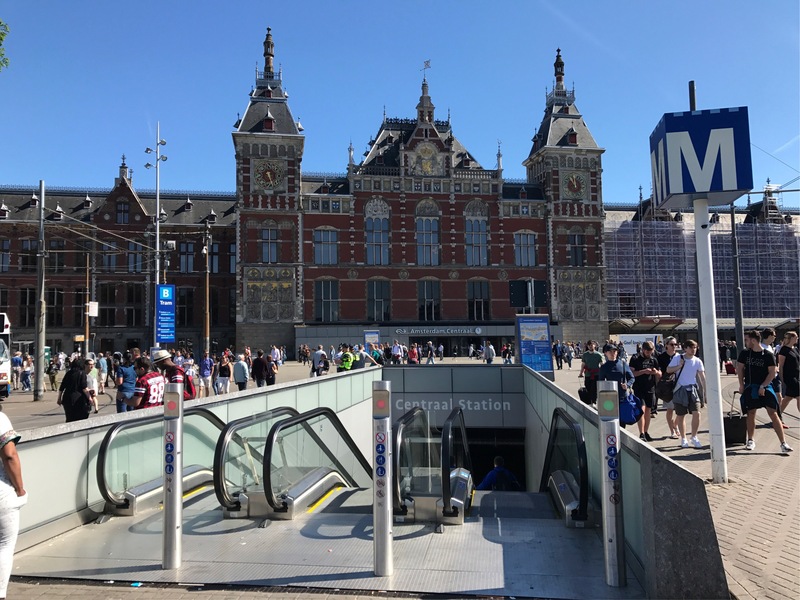 Below is a shot of Amsterdam Centraal, the main train station. I love that train stations overseas are typically grand buildings. 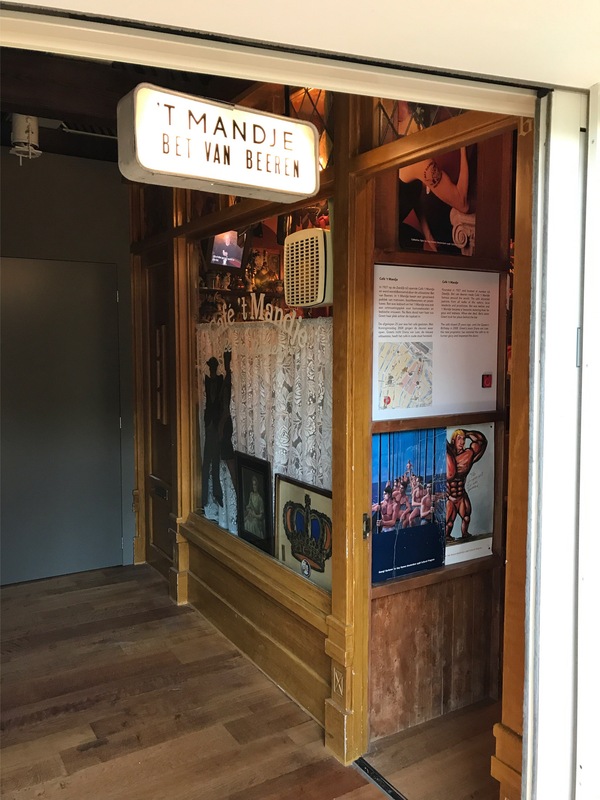 We walked to the Jordaan District, which is where the Anne Frank Museum is. In the photo below, you can see the line starting in the lower left and wrapping back and behind the white structure in the foreground and then along the side of the building on the right. The original entrance is just outside of the photo to the left. We only waited about 45 minutes that evening to get in, which was a huge blessing. 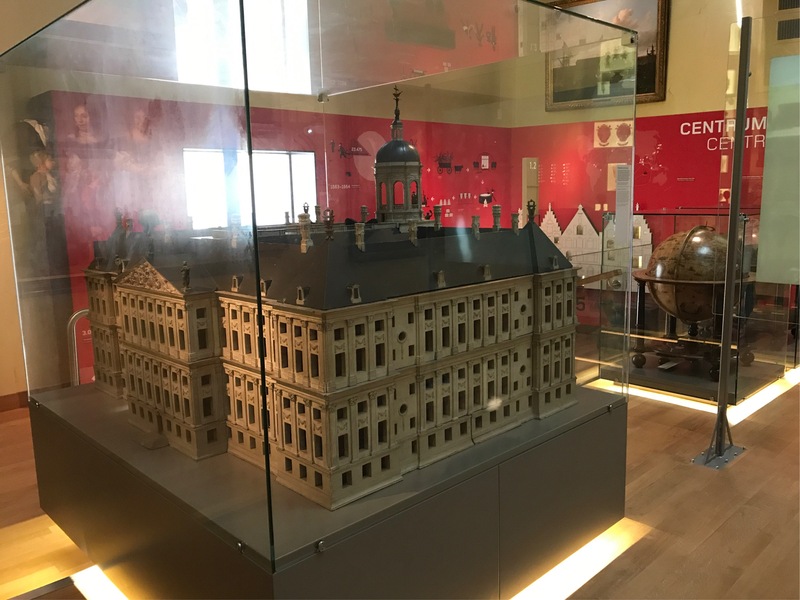 The museum includes the actual ‘secret annex’ where the Franks, Hermann, Auguste and Peter van Pels, and Fritz Pfeffer hid, Anne’s original diaries (mercifully spared during the raid) and other artifacts and displays from that time period. While the furniture is all gone, the walls of the annex still have the pictures and newspaper clippings Anne had glued to them. It’s a quiet and somber place, knowing the fate of those who lived there. 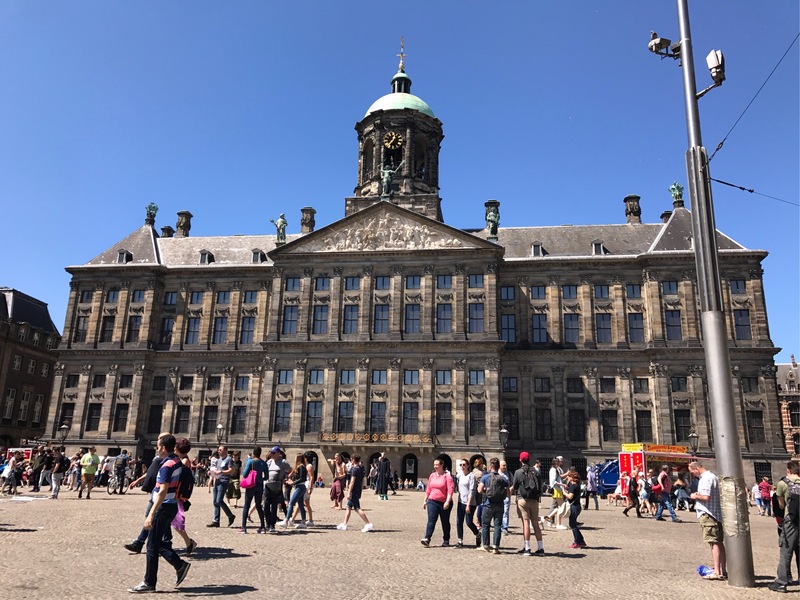 On a day trip to the city, Andrew and I started with Rick’s walking tour of the city, which brought us to Damrak and then to Dam Square, which is home to the Royal Palace. It was once so grand, it was referred to as the ‘Eighth Wonder of the World.’ It’s still used today for official functions. We toured the inside, marveling at the cavernous great hall, decorated with giant maps in the marble floor. 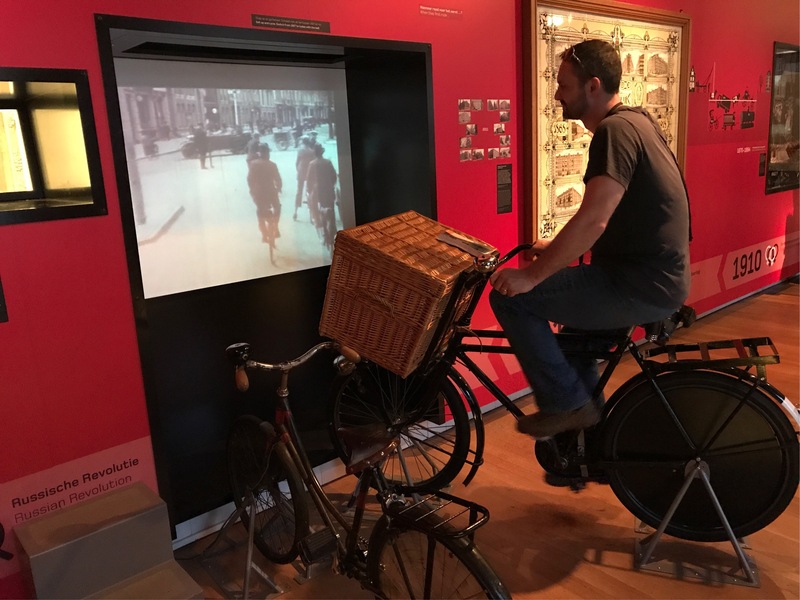 Continuing along the walk, we came to the Amsterdam Museum, which presented the history and current statistics of the city in a fun way using their ‘DNA exhibit.’ The museum includes interactive spaces (see Andrew, below, on a bicycle; as he pedals, the video progresses in time to modern day), models (see the Royal Palace, below next), artwork and even an almost-full-size replica of the first gay bar in the city (last photo). After the museum, we needed a snack! 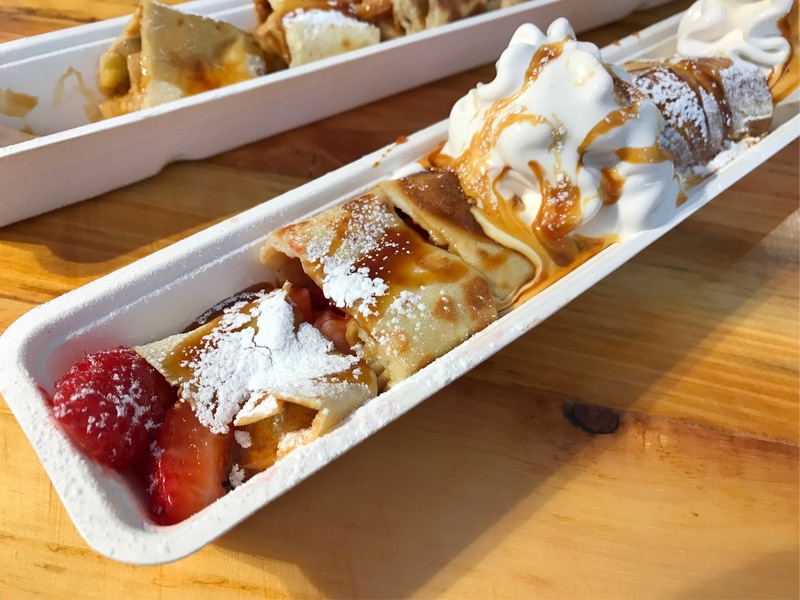 Thin pancakes (very similar to crepes) served rolled, filled and sliced are big here, so we went ahead and indulged ourselves. I chose strawberries with salted caramel sauce and vanilla ice cream. 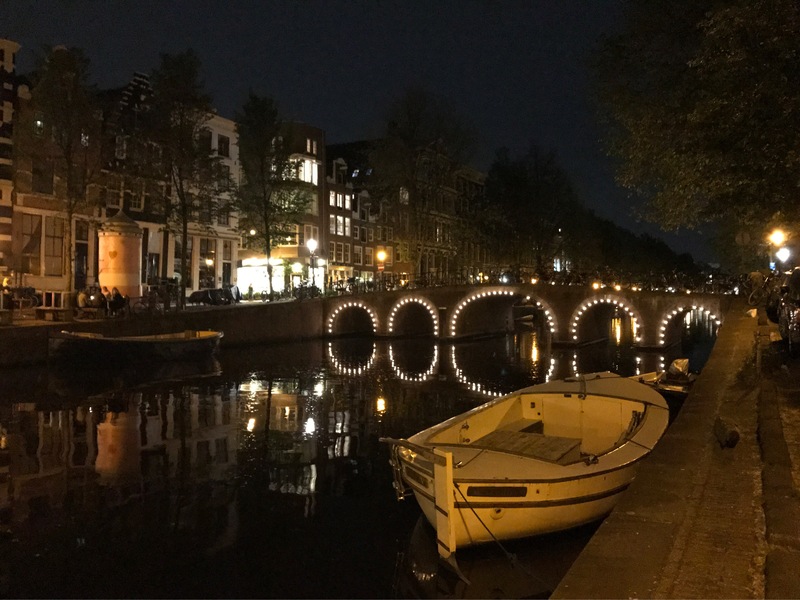 Amsterdam is known for its beautiful canals. 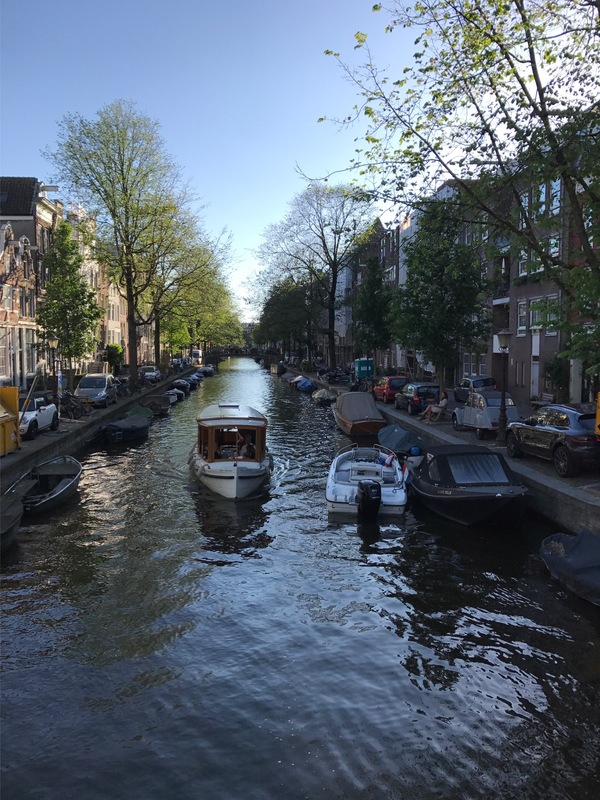 We didn’t take a canal boat tour this visit, but on a future visit we’d like to go on one of the smaller tours or perhaps even rent our own little craft and adventure on our own! 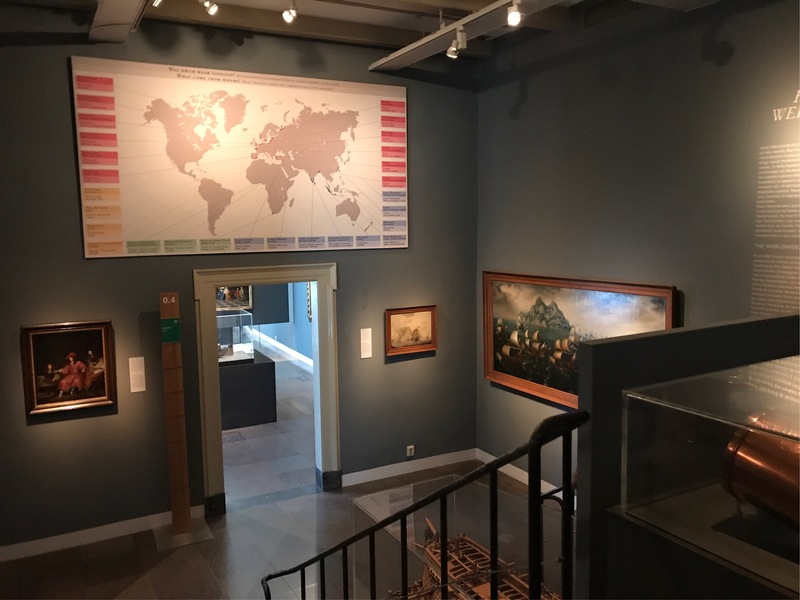 Posted on June 18, 2017 June 18, 2017 by thehealthypineapplePosted in TravelTagged amsterdam, amsterdam museum, anne frank museum, dam square, damrak, royal palace. Yes! We LOVE to travel!